One cannot blame the equipment for such ineptness on my part. 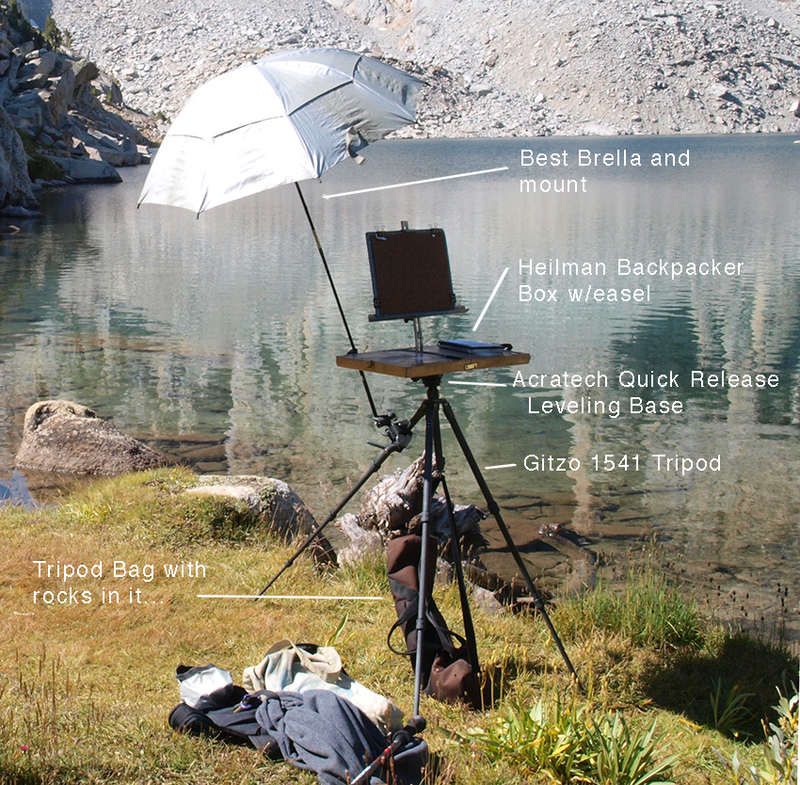 About 4.5 years ago, I did a blogpost on what gear I was then using for plein air work. I've altered my gear considerably since then, so I thought I'd give an update about what has changed, what has remained, and why. The photo above shows the setup I'm currently working with outdoors. First off, kudos to the Bestbrella, which I'd just started to use back then. I'm happy to report that I've not broken a single umbrella since I started using it. I credit the entire system... the flexibility of the fiberglass umbrella ribs, the sturdy mount, and the poles, which are strengthened at the joints by a sliding tube. A gale wind will likely demolish anything, including this setup, but for most painting expeditions, this works very well. The weakest link in that system is the poles themselves, as they have a short threaded insert that can become loose over time, causing a bit of play and wobble. Patty Kellner, the owner of Bestbrella, advised me to fix that with a specific type of thread locking glue, and it does the trick. Next up, I changed from a small All-In-One easel, to a Heilman backpack box, both of which will mount on a tripod. I enjoyed the All in One for its light weight, and ease of use, and it came highly recommended. The reason I discontinued using it was that I had developed some problems with numbness in my fingers after about 6 months. I have a full time job, where I daily use a computer with a tablet, so any plein air work with a specific configuration could either ease, or possibly exacerbate, any underlying issues I might be already having. Such was the case, unfortunately, with the configuration I was using at that point. The primary problem was that the image area was only an inch or so above the box holding the pastels. Think of a very small open suitcase with the pastels in the bottom, and the artwork mounted in the lid, set at 90°. In order to keep my wrist and arm out of the pastels, I started raising my elbow up to the height of my shoulder, and within a few months, I was suddenly dealing with numbness in my fingers, and a fair amount of pain in the tendons in my arm, etc. 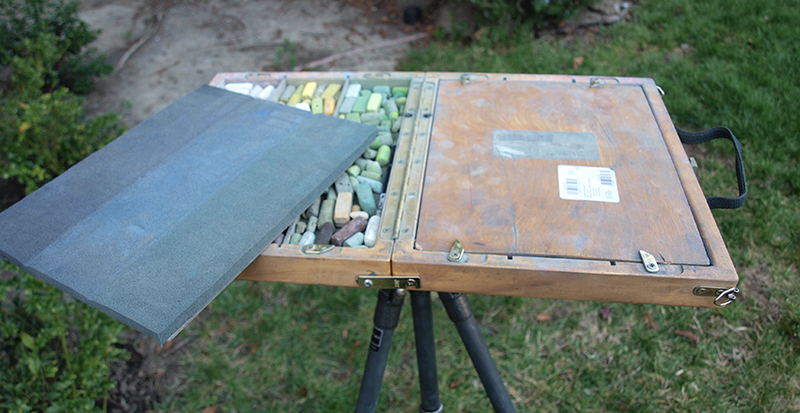 Conversely, the easel for the Heilman box is like a small music stand that plugs into the top of the box and keeps the image area comfortably separated from the pastels. 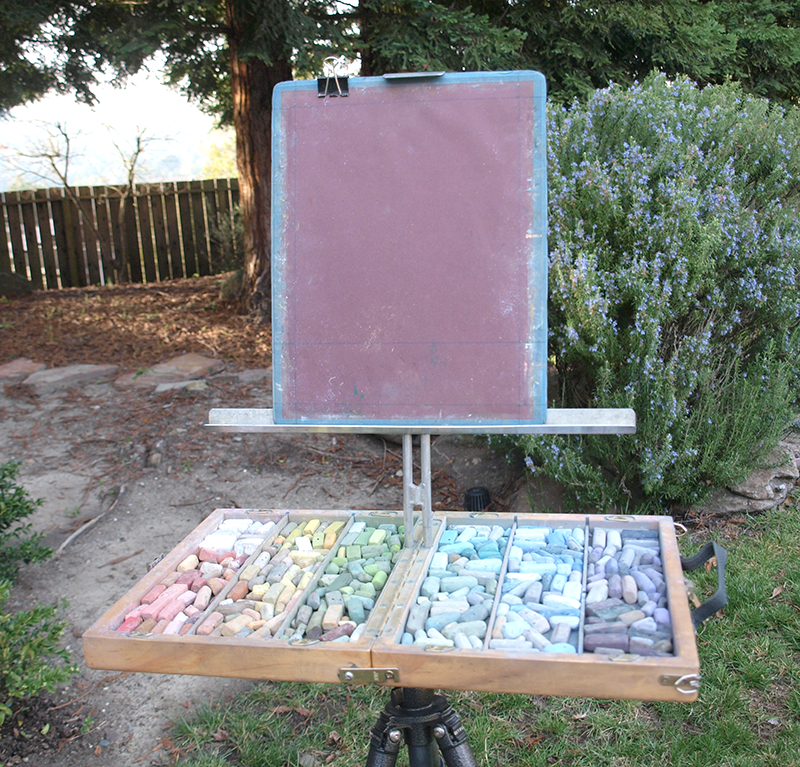 In addition, the easel is slightly tilted, so that one is not, by default, restricted to a 90° angle on the work surface. I should note that All in one has since changed their hinge setup to allow for other tilts. In addition, many artists use their product with no issues at all. 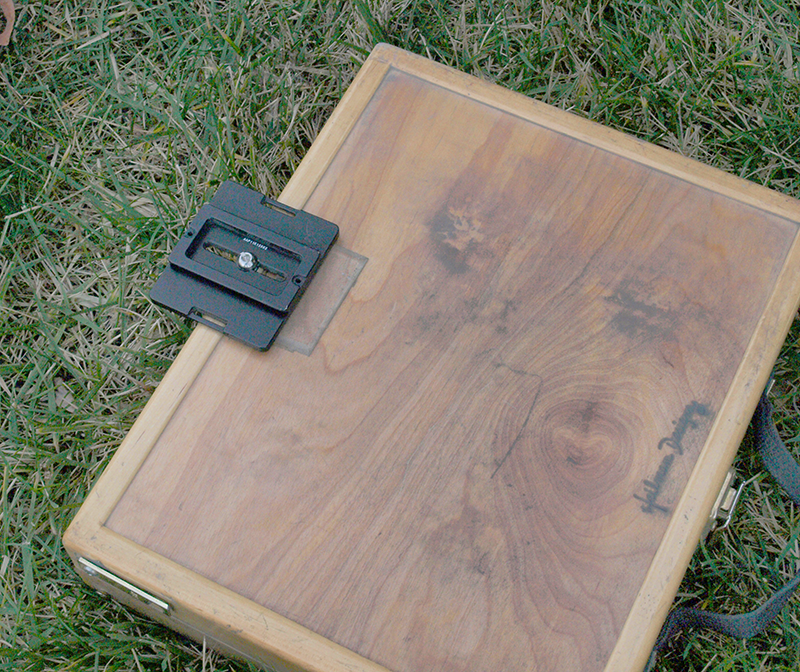 A view above of the Heilman Box mounted on a tripod, with one compartment open. One of the benefits of this design is the way the foam covered box lids lock down on the pastels to prevent them from moving around during transport. Here is the easel mounted onto the box. It is adjustable, and has the capacity to keep the artwork well elevated above the sea of pastels below. This was the ergonomic remedy I was seeking. Here is the bracket that mounts the box to the tripod. It is an Arca-Swiss compatible type, which is a wedge shaped mount that is an industry standard in professional grade photographic equipment. These brackets come in different lengths depending on the weight and size of the equipment to be mounted, and are available from many manufacturers. This one is made by Sunwayfoto. For the tripod mount, I chose what is called a leveling base. Also available from several manufacturers, they offer a limited range of tilt, and are used to level equipment when the ground plane is uneven, without having to resort to changing the lengths of the tripod legs. This mount was designed for photographic use, but it serves some useful needs for the artist. First, the limited tilt range of a leveling base means that it is unlikely to unexpectedly flop so far over as to dump all your pastels out of the box. The tilt range of the mount I use is limited to 10° in any direction. I consider this a built in fail-safe mechanism. Like any regular ballhead type mount, it can swivel 360° in any direction, which is useful when a tripod has a non-rotating center column, as mine does. This means you can rotate your art and your pastels to keep work in the shade, or to paint a different view, without having to pick up and move the tripod. 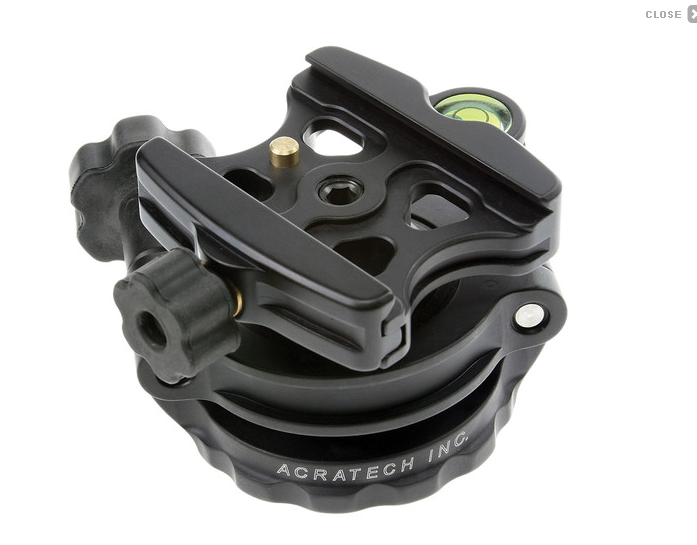 The top element is the Arca-Swiss compatible clamp that grips the wedge on the box. 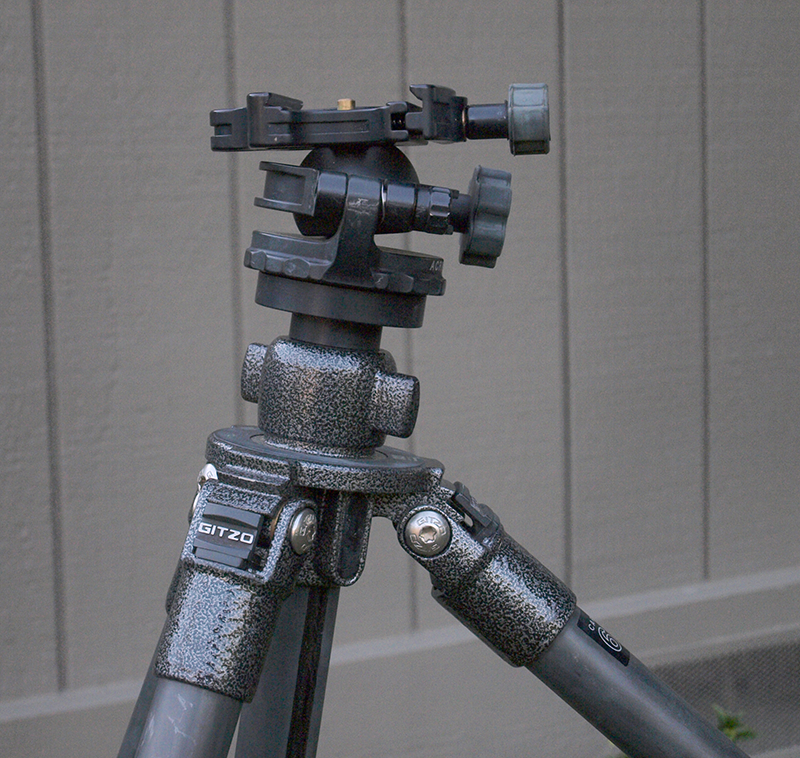 You can see in this side view, how the box can be mounted level, while the center post of the tripod is off vertical, and the tripod legs are set at different angles. There are many types of mounts that can achieve this, but I chose what I did for simplicity, ruggedness, and light weight. 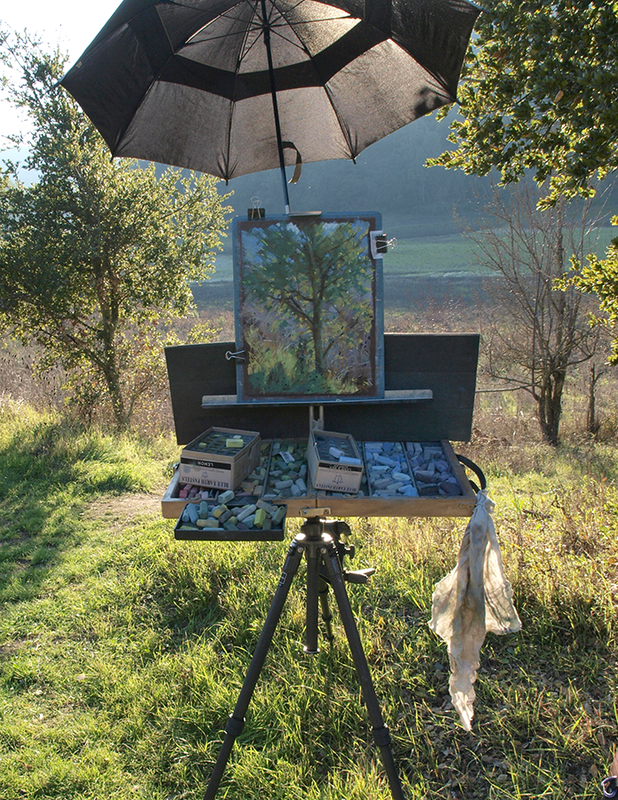 The primary qualities in a tripod that a plein air painter benefits from are stability, ease of use, and light weight. The weight is really only an issue if you regularly carry all your gear a fair distance to paint. Since I periodically hike several miles into some locations, I am always interested in lightening my burden. It is certainly true that I could lighten my load more effectively by going on a diet. In picking the Gitzo 1541 I found I reduced the weight of my tripod by half a pound, and gained noticeably more stiffness and stability. The catch is that it cost more than 3x as much. I chose to use professional photographic equipment because it is designed to securely hold thousands of dollars worth of lenses stable, in all sorts of conditions, and still be portable and reliable. In about 18 years of using tripods, this will be my third, and possibly the last one I'll ever need. Does that mean it's perfect? Nope. I do wish it had the leg angles I was used to on my old bogen/manfrotto, or the tripod sold by Easyl, that I last used, but I've compensated by setting one leg longer, and at a wider angle, than the other two, so that it has a stance not unlike a Gloucester easel, which gives it a stable footprint. Here's a typical setup with a few other functional elements to point out. First, I do use a small accessory tray (available from Heilman) that hooks onto the side of the wooden box to store pastels that I'm using for a scene. In this picture, I'm also using the wooden lids to lean against the back of the easel to keep direct sunlight off my sticks. This does not work at all in the wind, by the way, and makes me miss the All in one box that self-shadowed my pastels by design. Lastly, I have a rag handy to clean my fingers and pastels while I work. And, like many, I still feel the need to haul more pastels around than will fit in my box, so you can see a Blue Earth box (and lid) sitting on top of my other sticks. What a mess! I can't say this is the 'ideal' setup by any means, but going this route has kept my RSI from recurring, improved overall stability, and lowered weight. 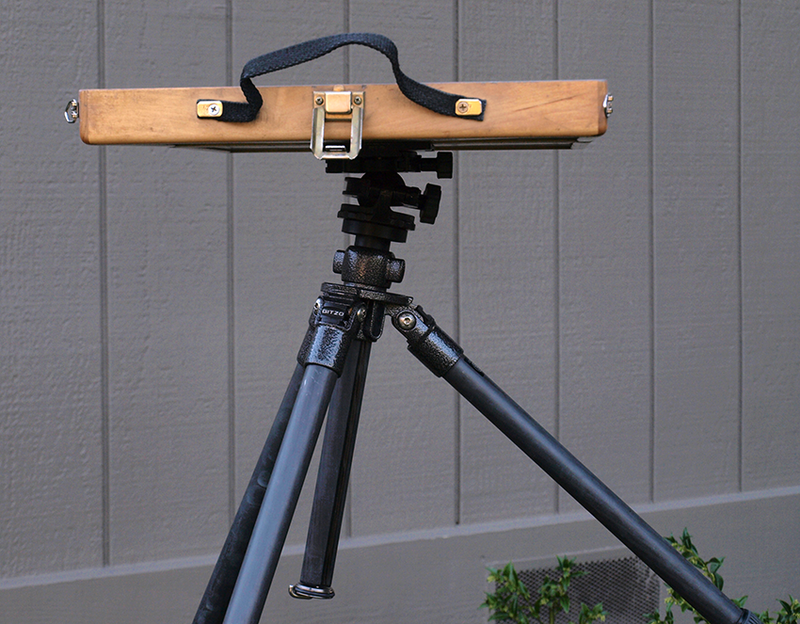 During my research, I did look carefully at mini-gloucester type setups where the box is mounted on the tripod legs, below the apex, and the artwork is on a separate easel that attaches to the tripod head. In terms of weight distribution, I think that is one of the most stable of all configurations, as it significantly lowers the center of gravity. Accordingly, I tried the Easel Butler out and also ordered a fitting that allowed me to mount the detachable Heilman easel to the tripod head. I was not satisfied with the result, however, as I was very nervous about the pastel box getting knocked off the 2 bars, as the weight of the box (~11 lbs) was enough to slightly tilt forward the aluminum cross brace holding the bars. Yes, one could bungee it on, etc., but at this point the setup starts to become more laborious, as the shelf has to be assembled and mounted, the box placed on it, then secured, the easel separately put on, etc. If Heilman made a version of their box with a fitting that was dedicated to mounting on tripod legs, I would definitely give it a try. There are several such boxes made for painters, by the way, of which the Coulter is perhaps one of the original, and simplest, versions of such a design.